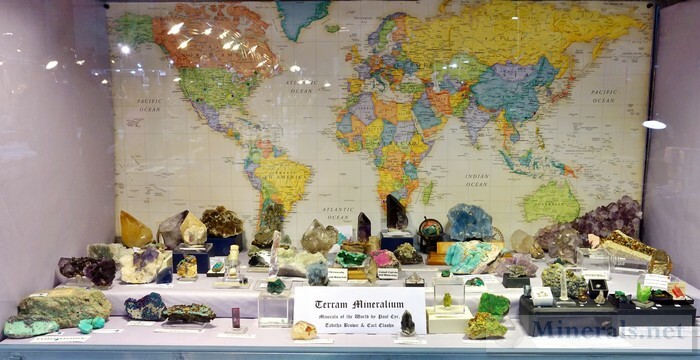 This is our final post on the 2016 NY/NJ Gem & Mineral Show in Edison, New Jersey. 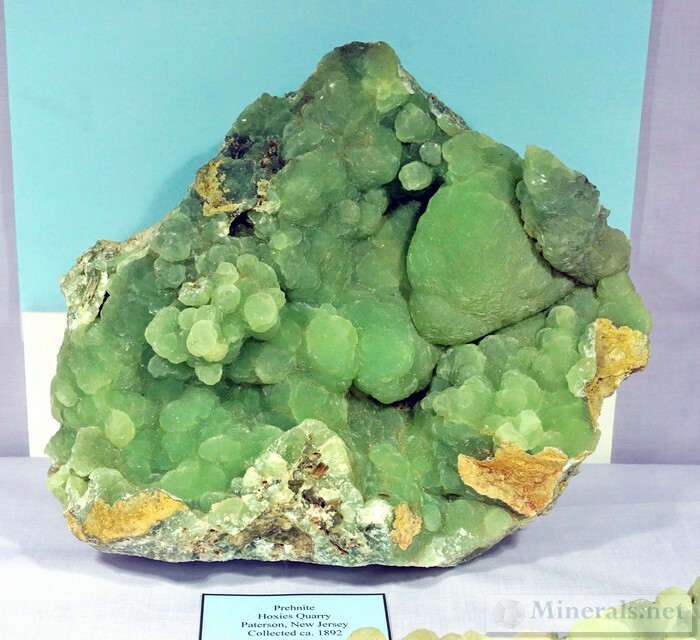 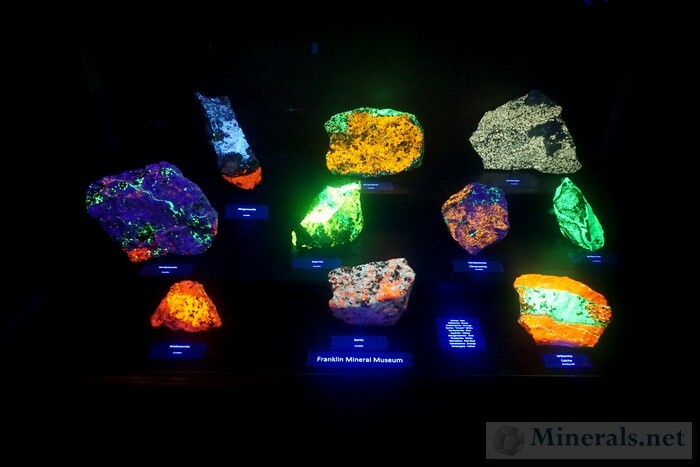 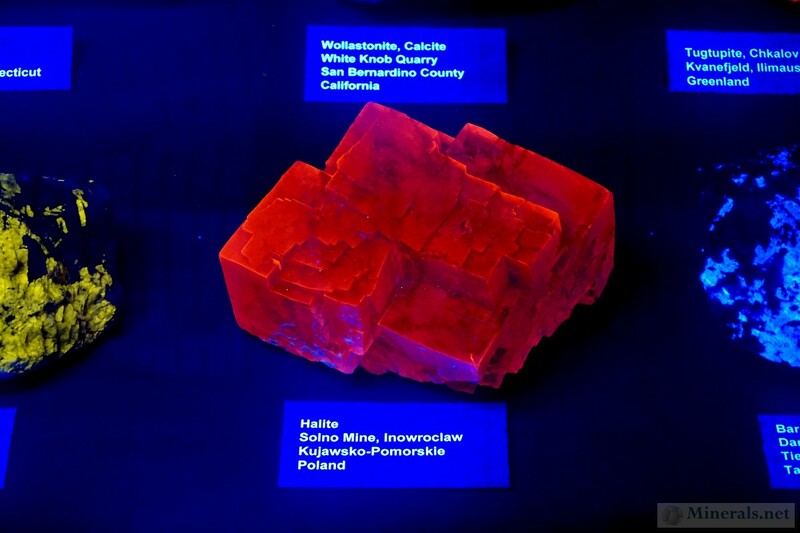 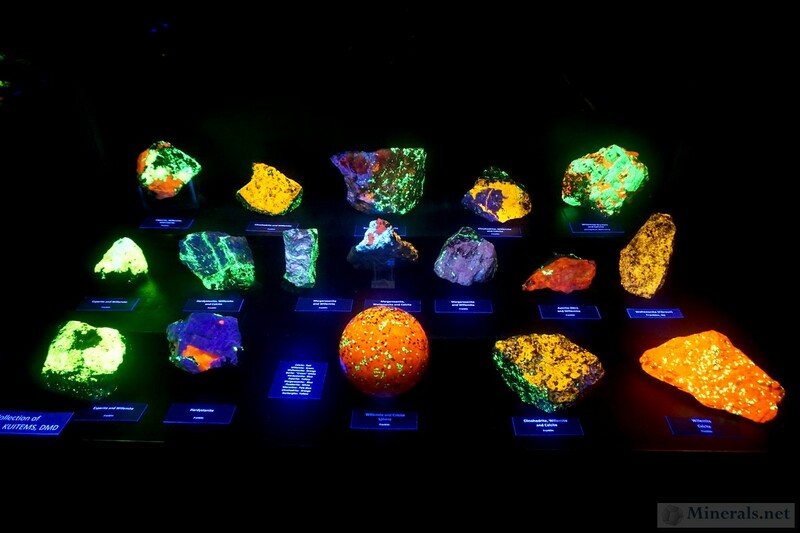 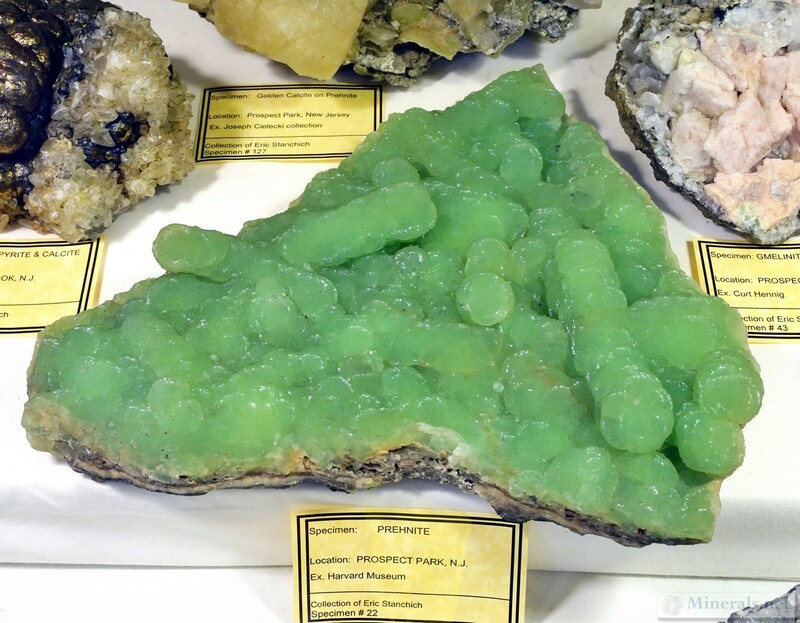 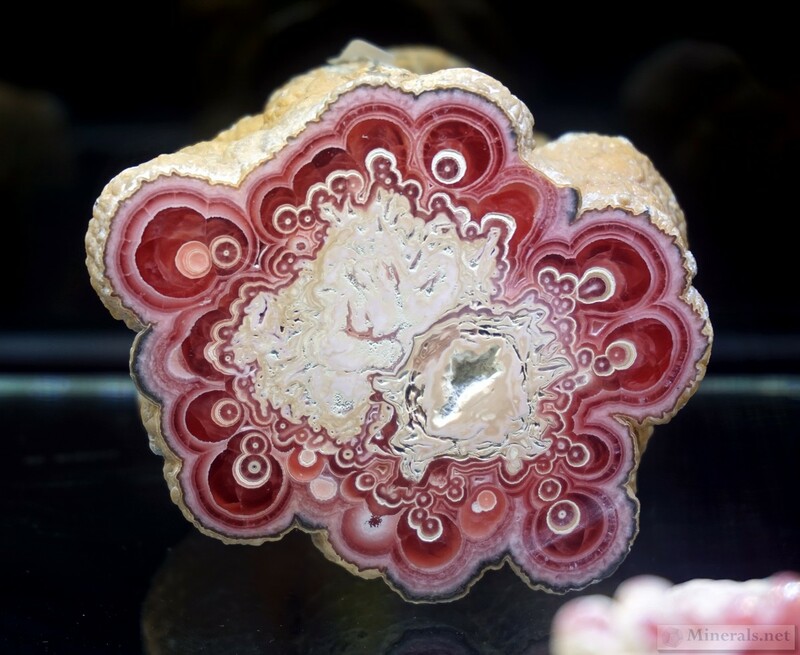 The show hosts a phenomenal public exhibit of fluorescent minerals, with hundreds of fluorescent minerals on display. 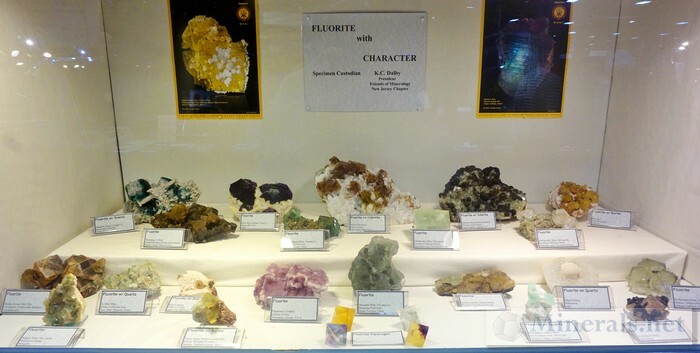 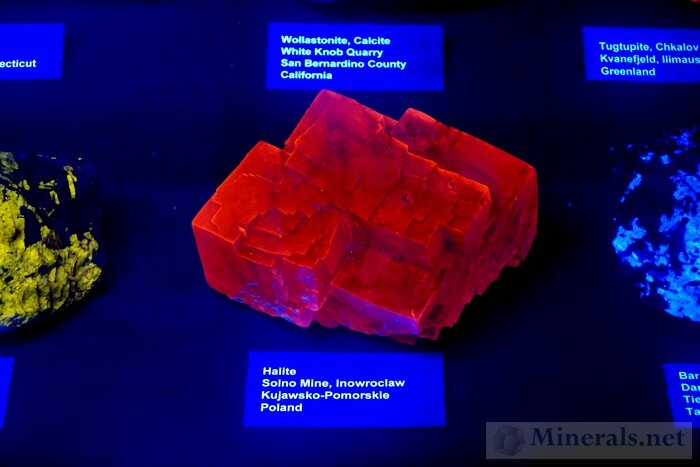 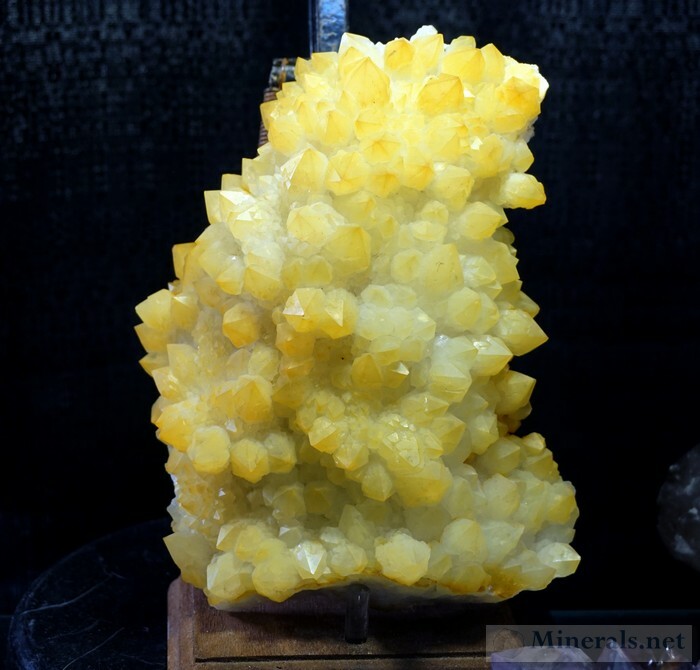 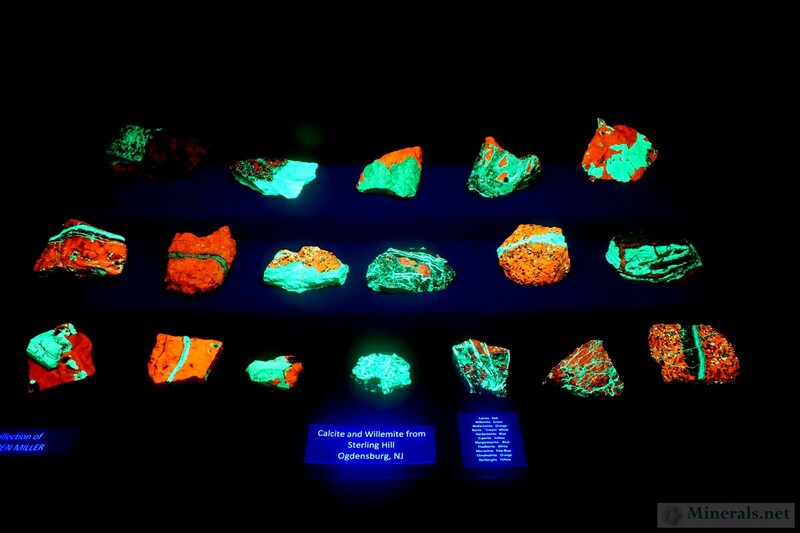 The fluorescent displays are organized by the Franklin Mineral Museum, Sterling Hill Mining Museum, and several private collectors specializing in fluorescent minerals. 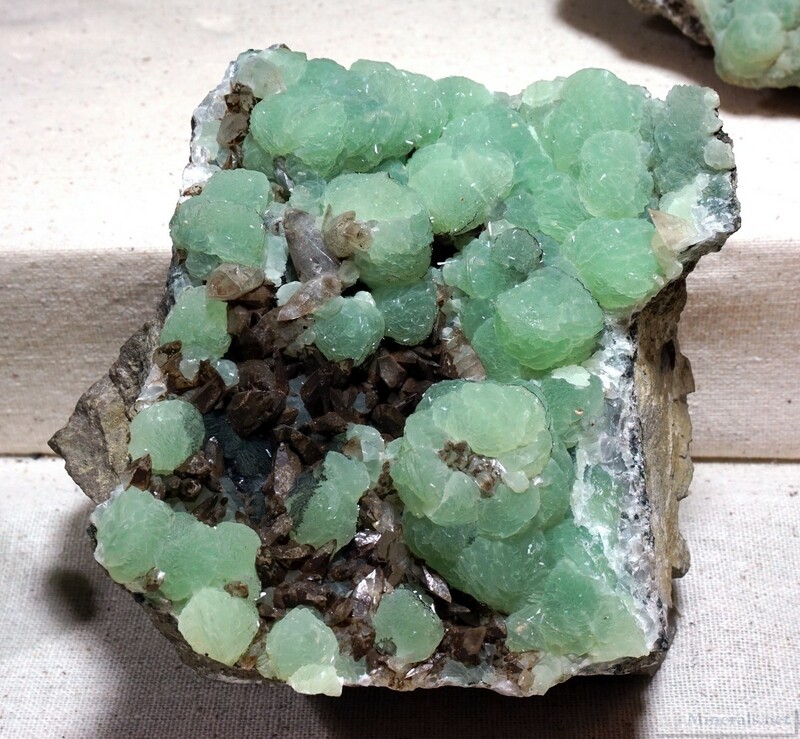 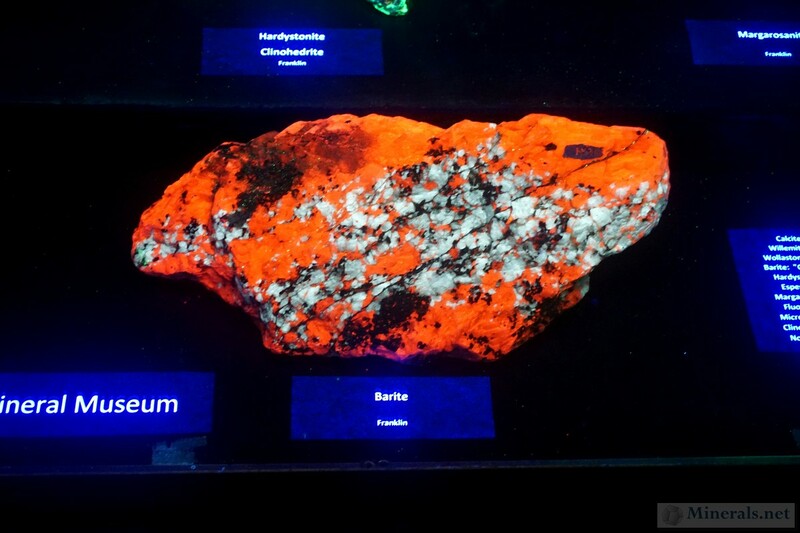 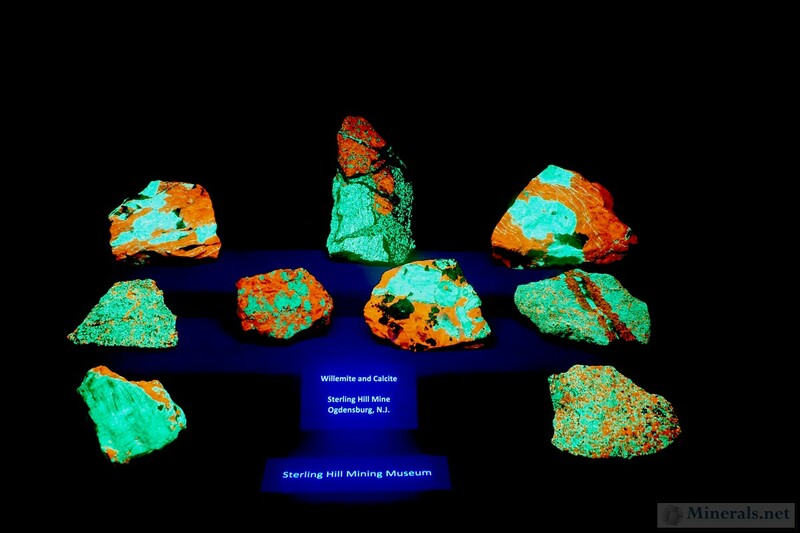 Most of the minerals in the fluorescent display are from Franklin or Ogdensburg, New Jersey. These localities, which are about 2.5 miles apart from each other, are known collectively as the fluorescent capital of the world due to their abundance or fluorescent minerals. 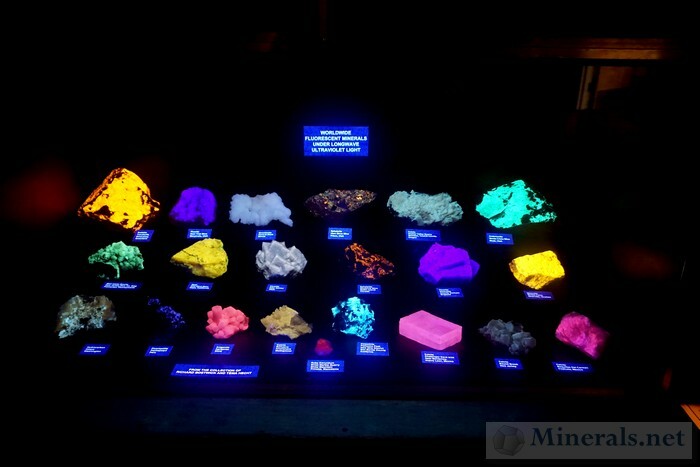 We are proud to share with you just a sample of the many fluorescent mineral cases and minerals that were at the show. 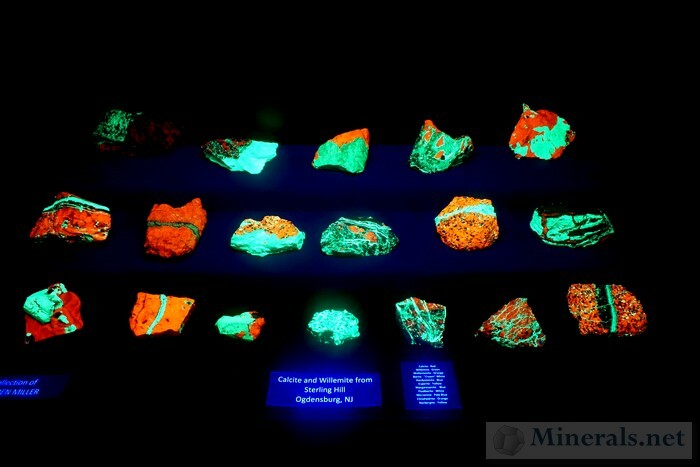 Please click the photos below for larger pop-ups. The 2016 NY/NJ Gem & Mineral show had an interesting array of minerals, from new finds to classic pieces. 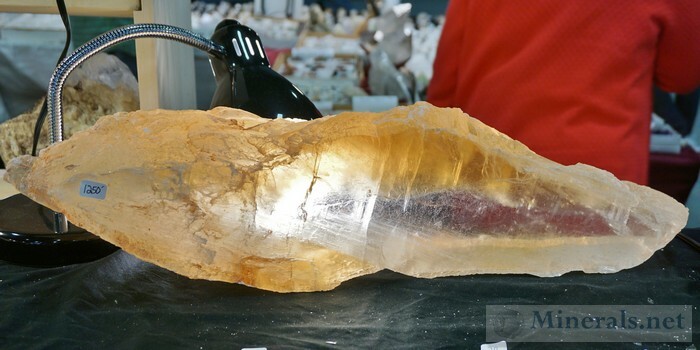 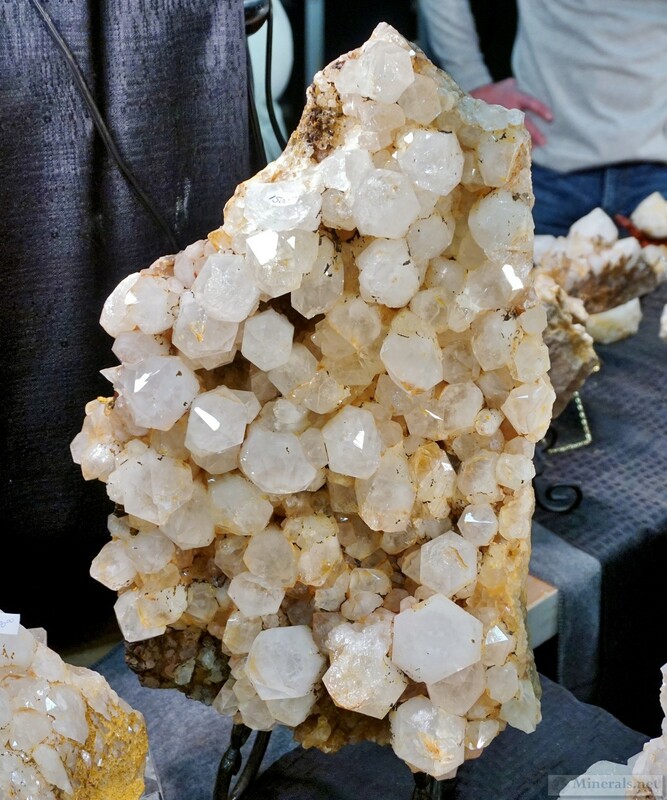 One of the more interesting events that everyone at the show buzzing about was a booth by hikers James Pascale and Jordan Salits, who had huge Quartz crystal clusters for sale from a new find in Ellenville, New York. 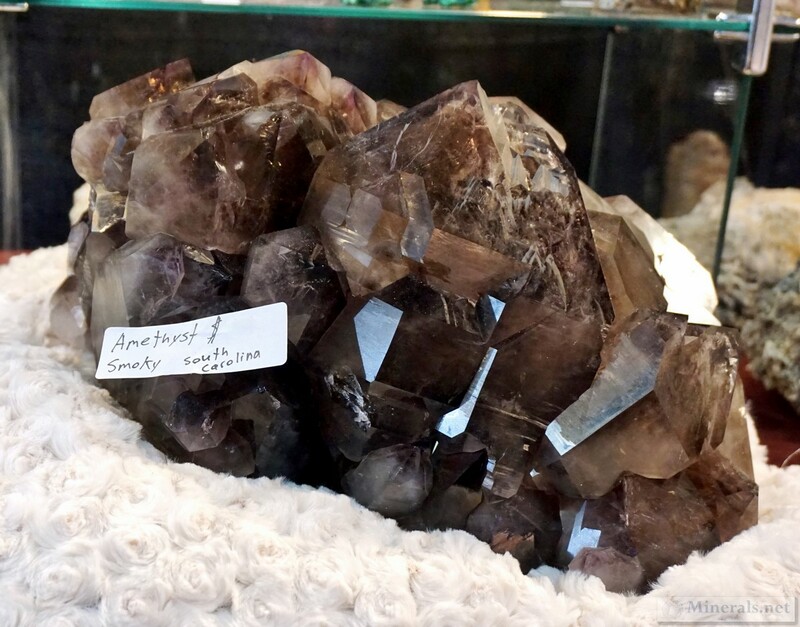 This classic locality produced large Quartz crystals many years ago, but James and Jordan accidentally stumbled upon a new occurrence of huge crystals while hiking the area. 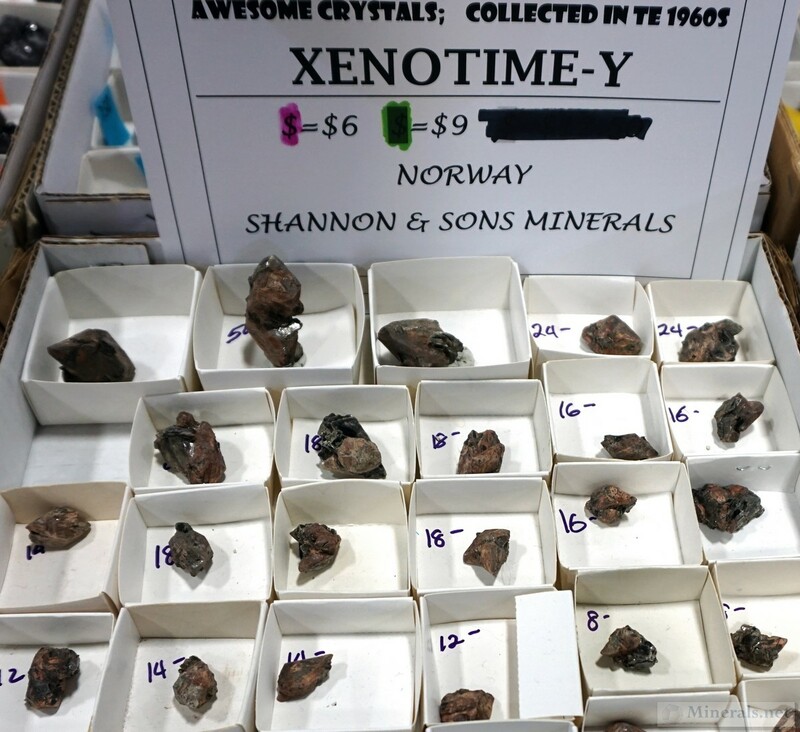 Another area of interest was Gary Maldovany's table which had an entire section of fabulous, unusual Amity (New York) minerals that he purchased from Glenn Rhein. 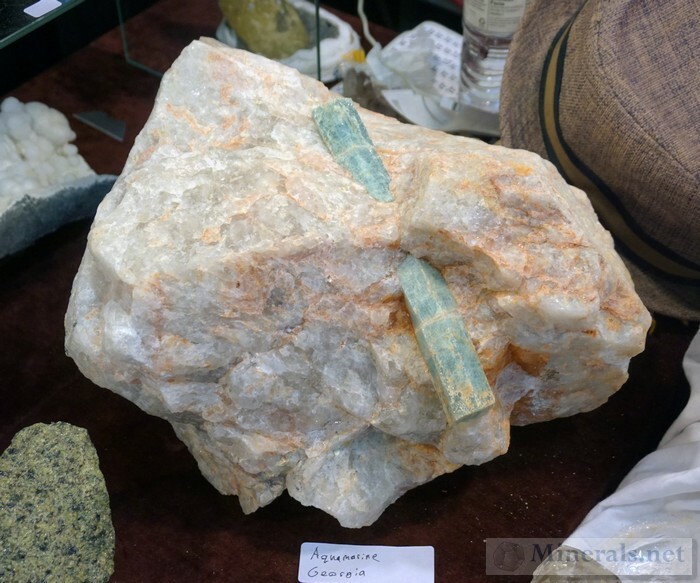 Other new finds including Amazonite from Madagascar (reminiscent of the Colorado material,) Almandine from North Carolina, and green Quartz included with Chlorite from Upstate New York. 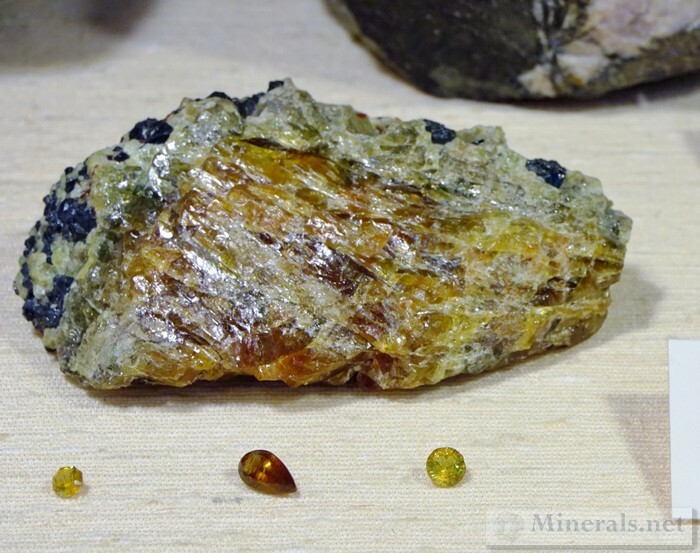 Click the pictures below for a larger pop-up. 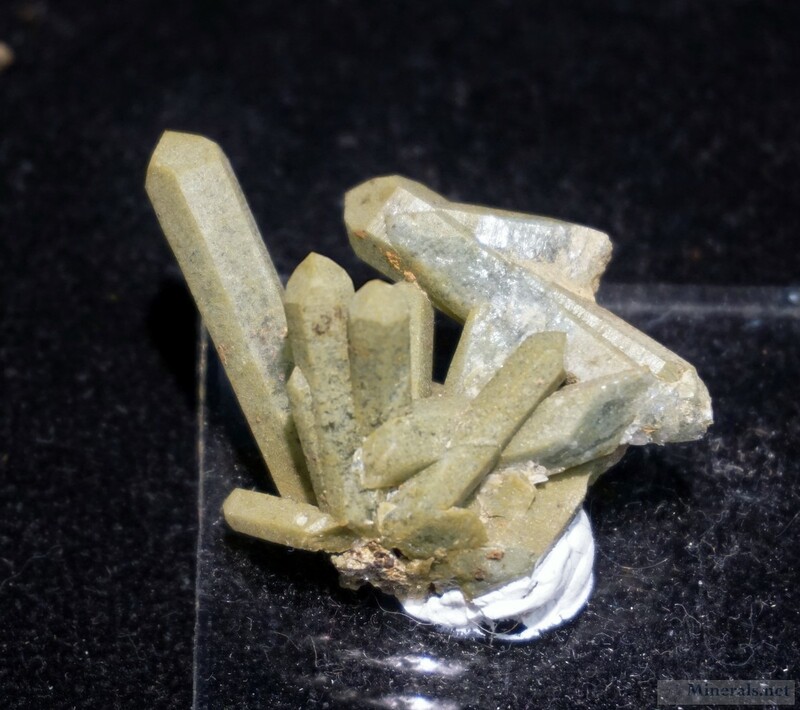 Chlorite-Included Quartz from Saratoga County, New York. 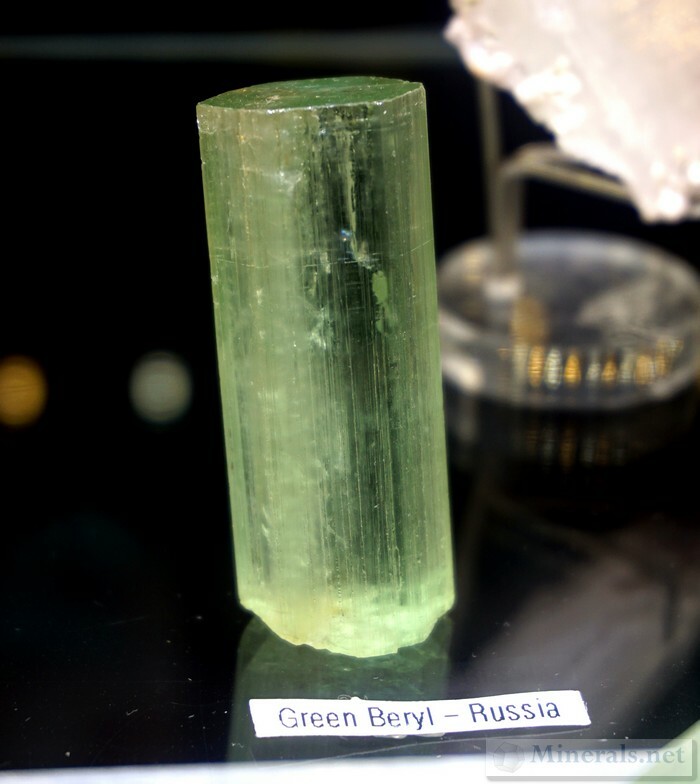 Discovered by Bill Lombard. 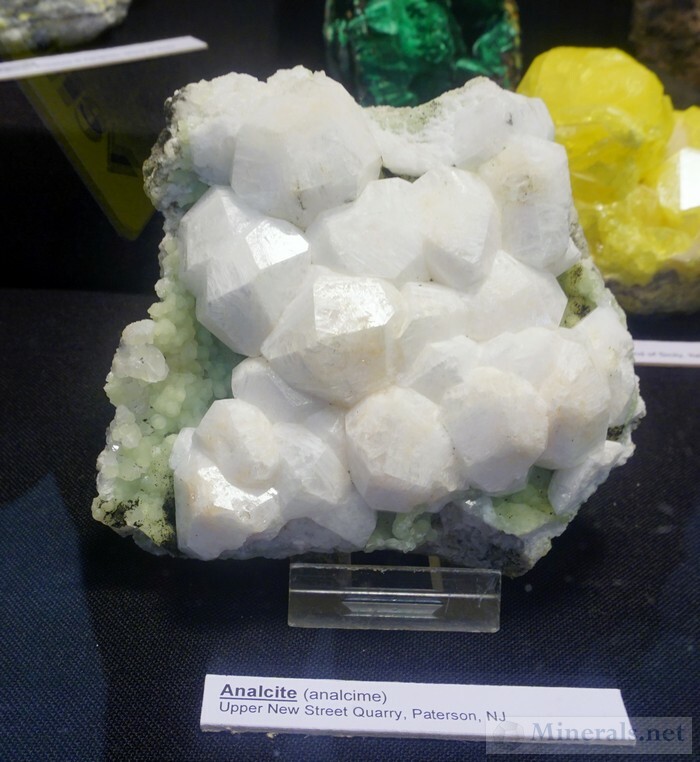 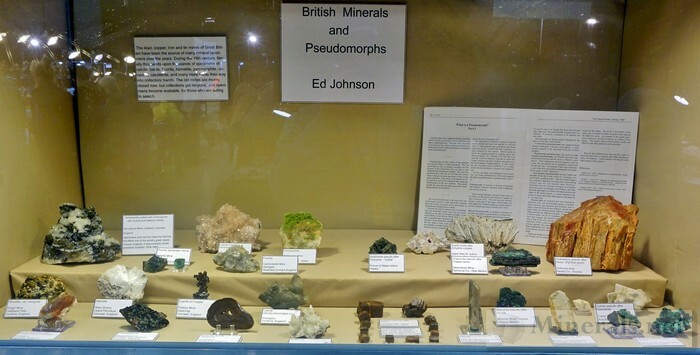 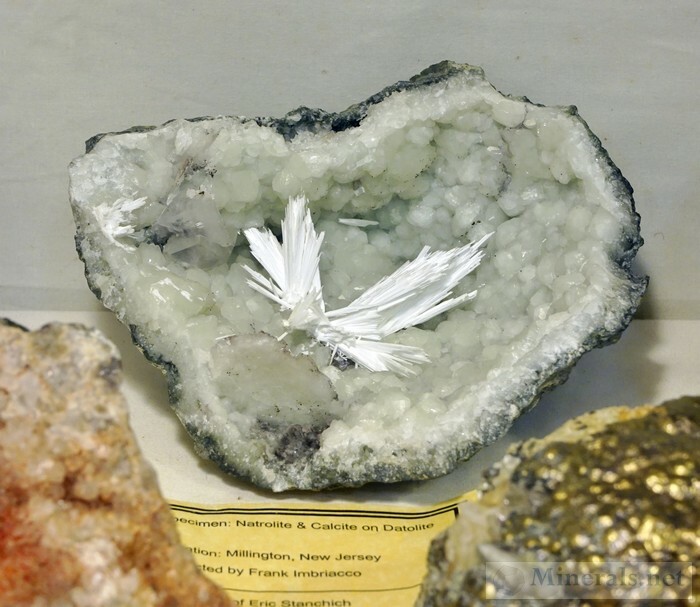 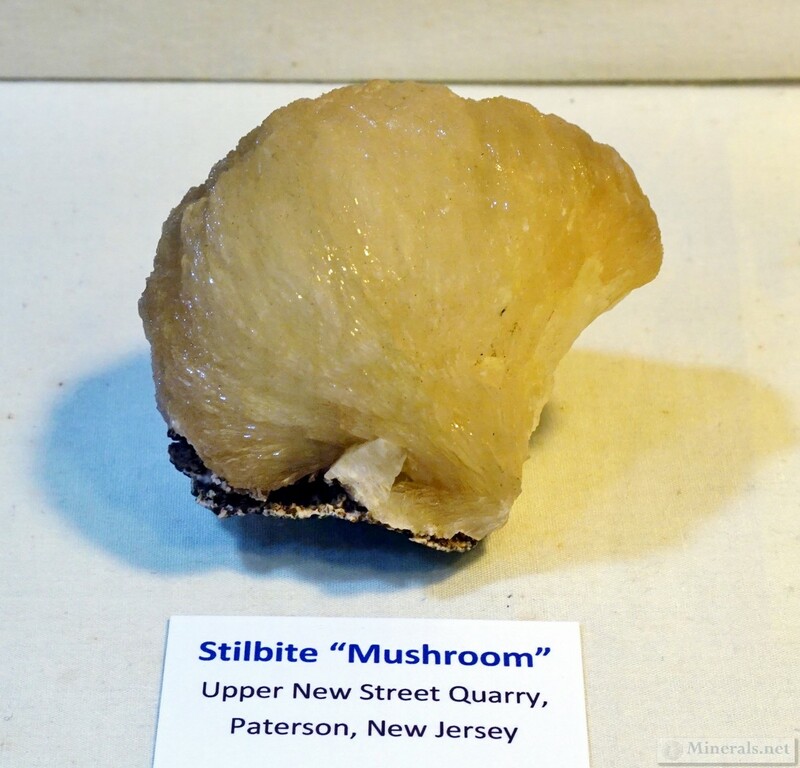 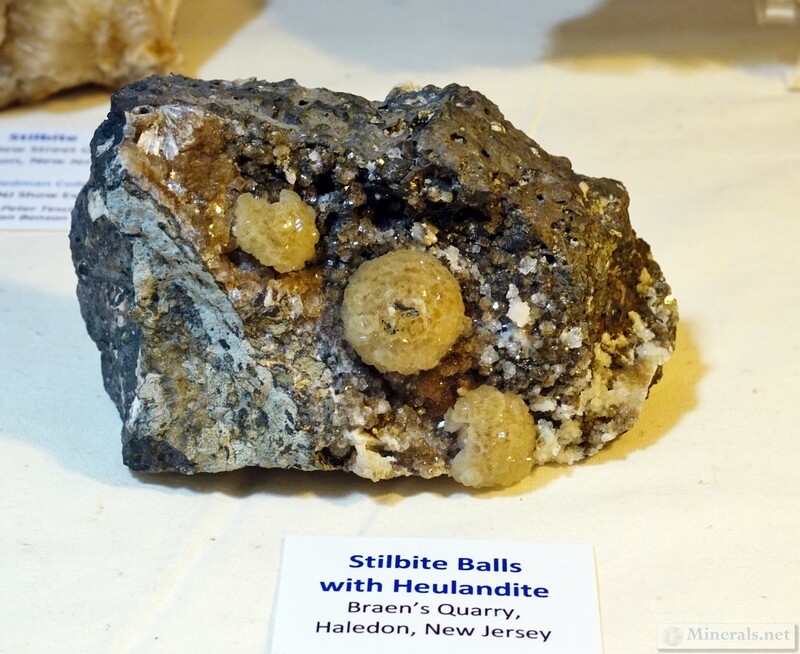 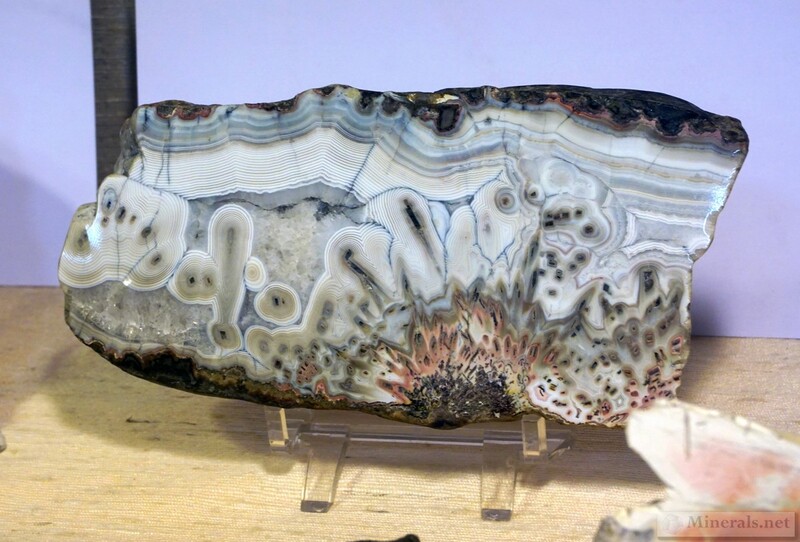 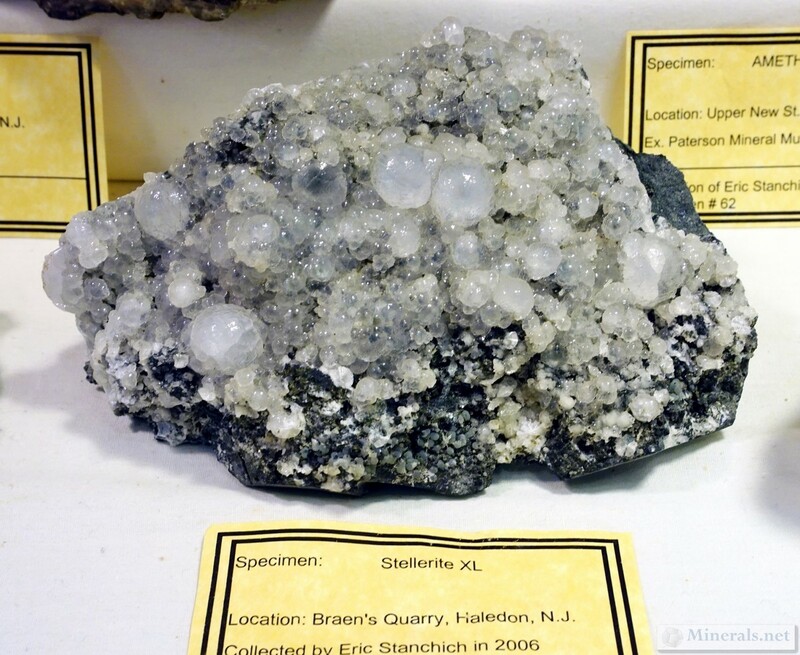 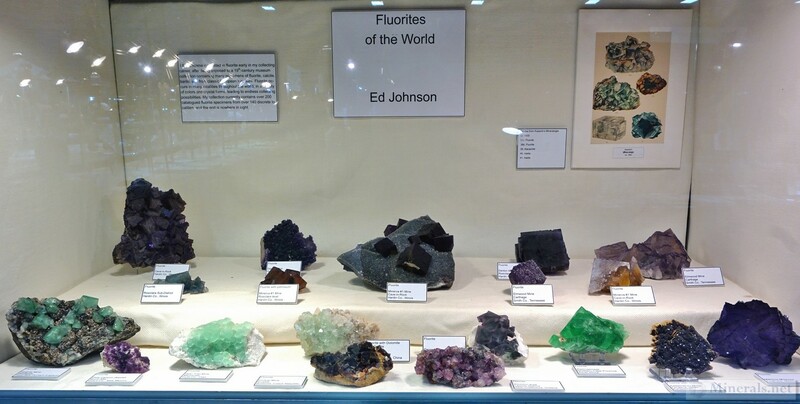 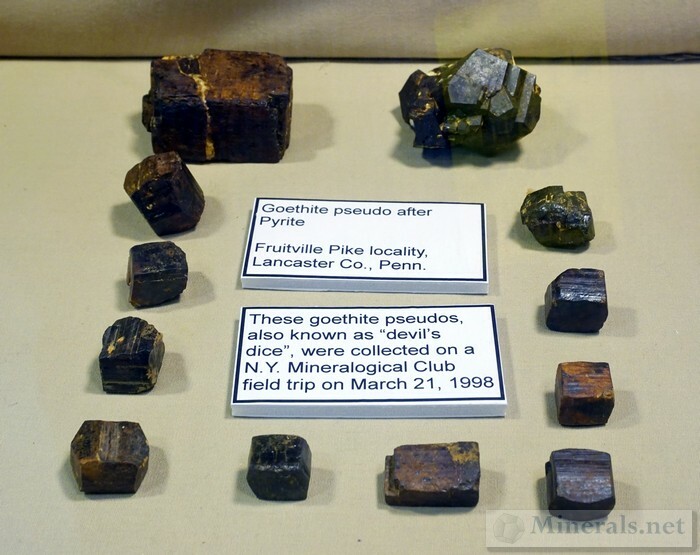 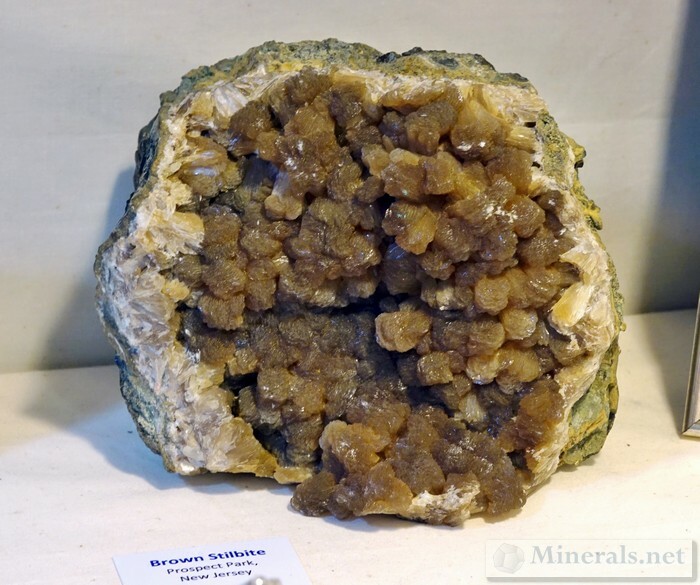 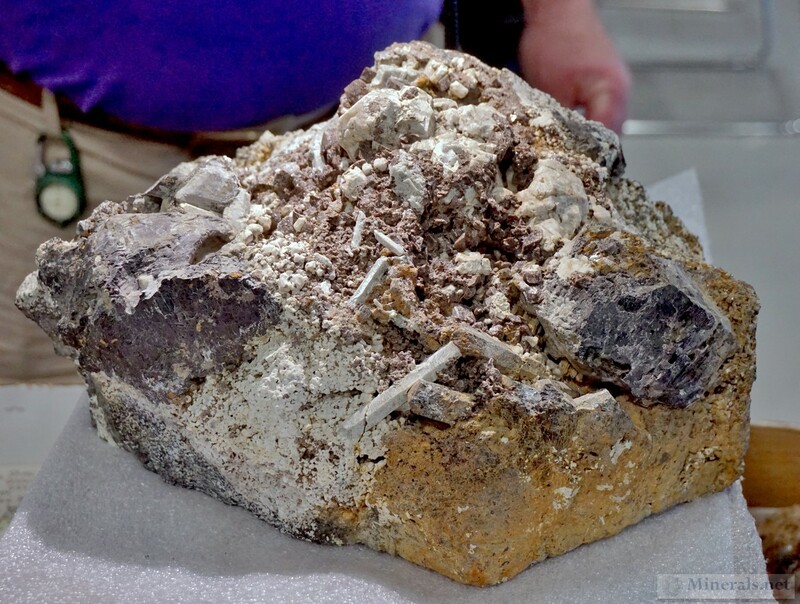 Continuing along with our posts of the NY/NJ Gem & Mineral Show, this one focuses on the display case that I organized on Stilbites of New Jersey. 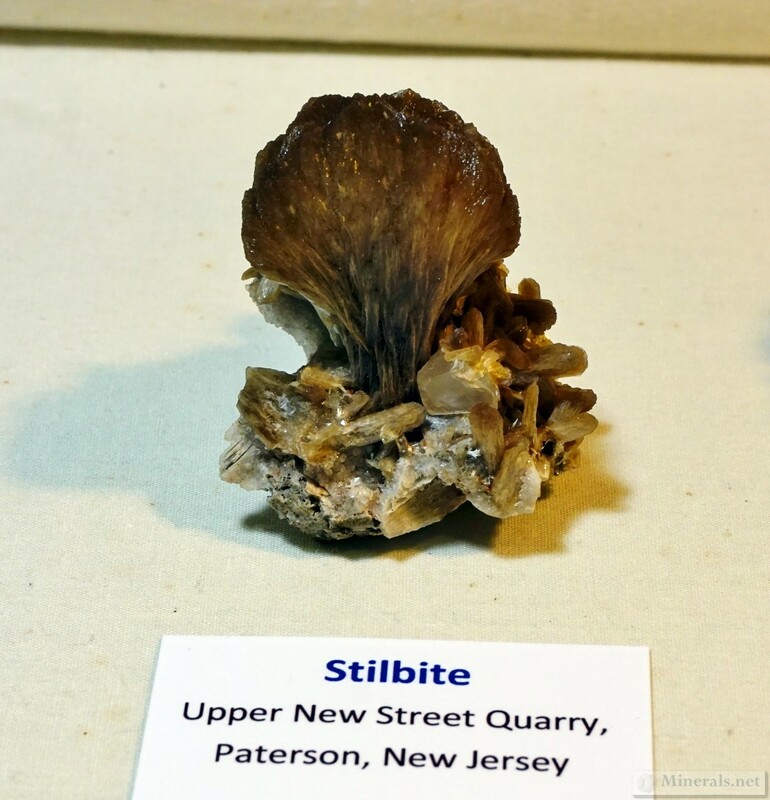 The traprock quarries of New Jersey have produced the best Stilbites in the United States, and rank among the best in the world for the finest Stilbites. 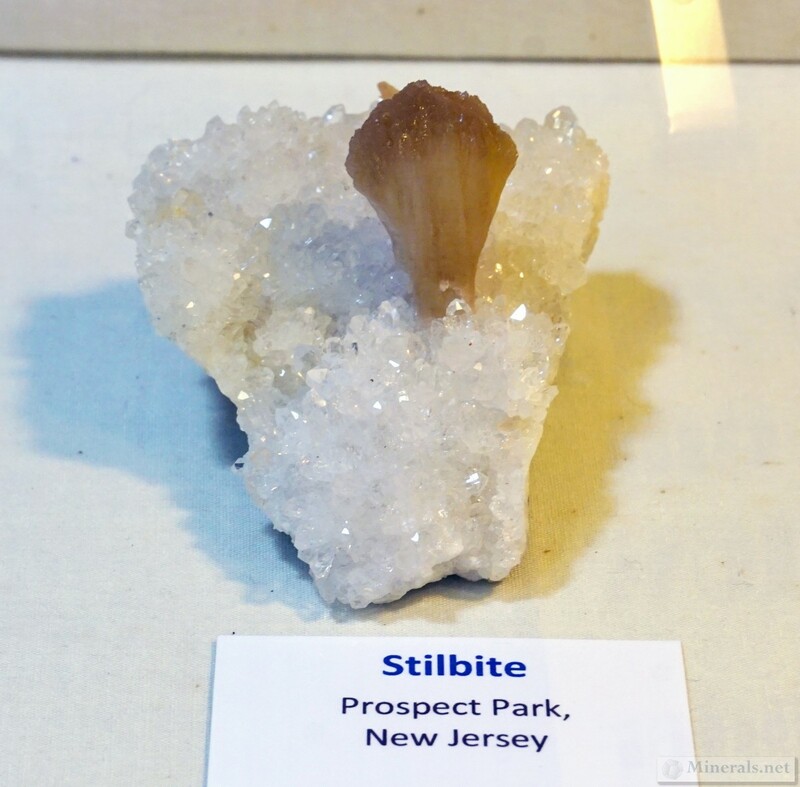 Being that this show took place in New Jersey, I felt it was appropriate to have a theme based on an important local mineral. 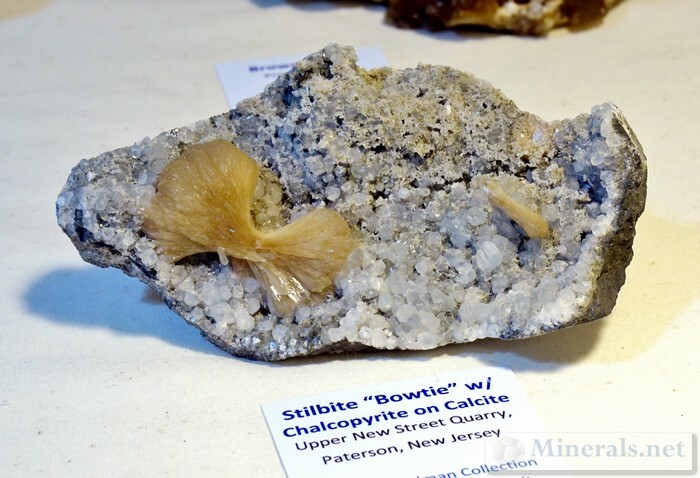 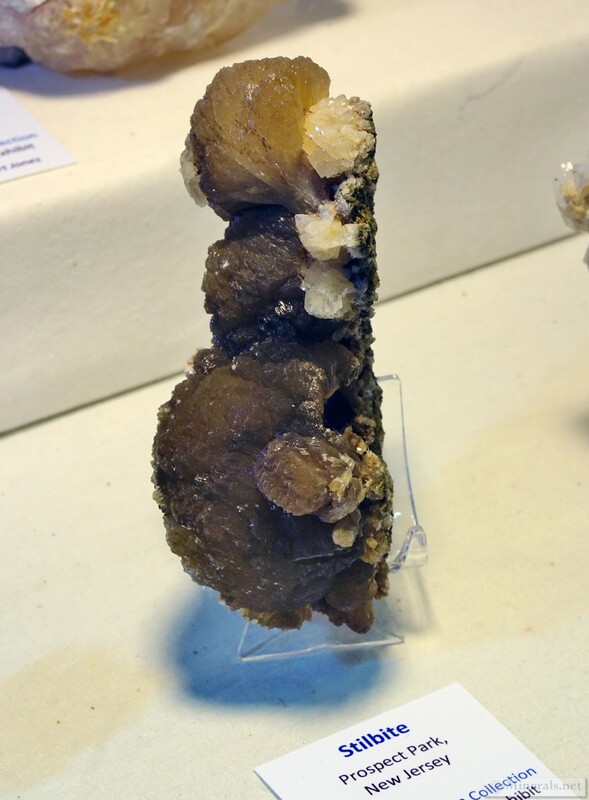 This post shows some of the individual Stilbite specimens in my display exhibit at the show. 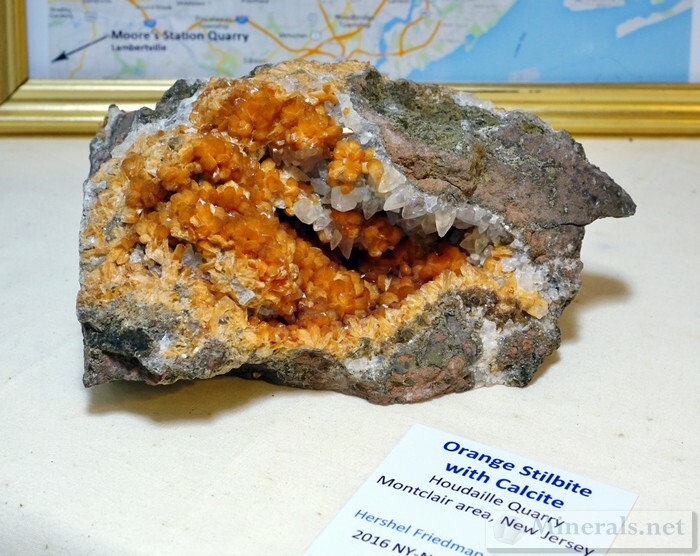 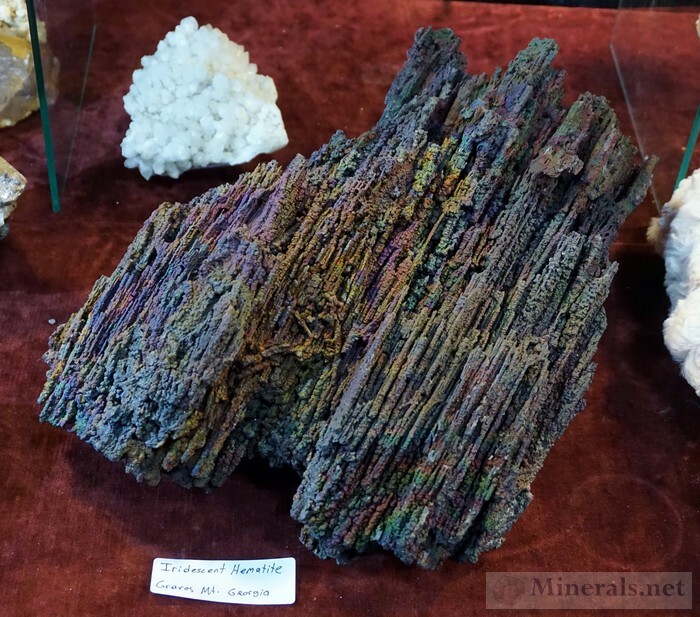 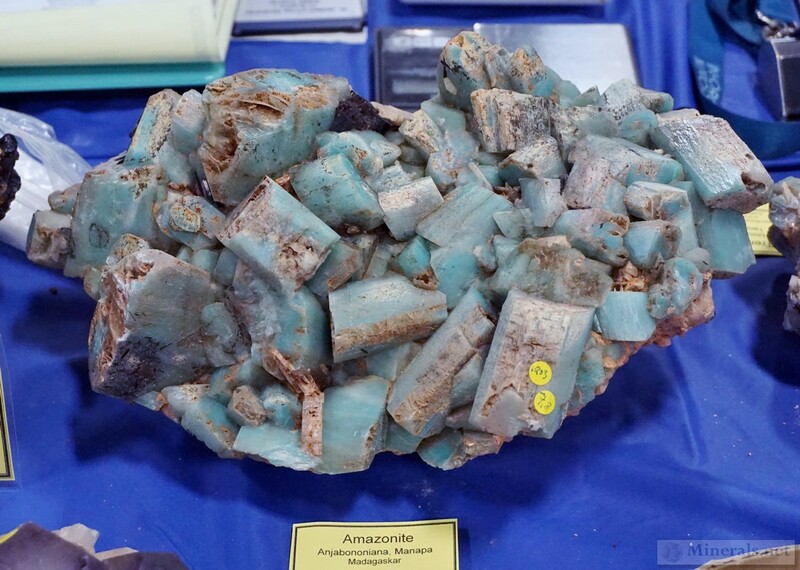 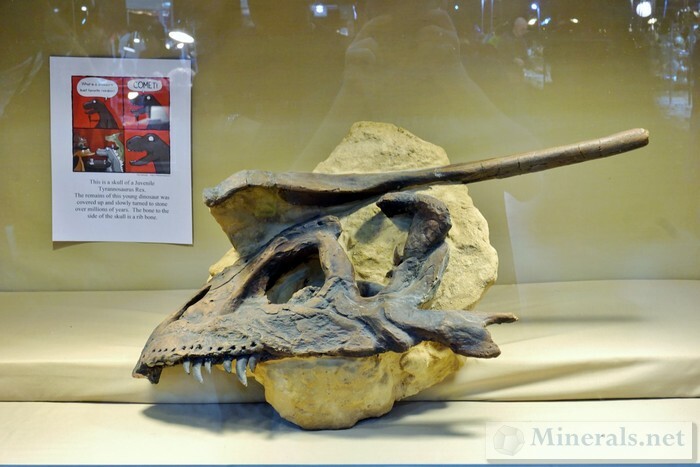 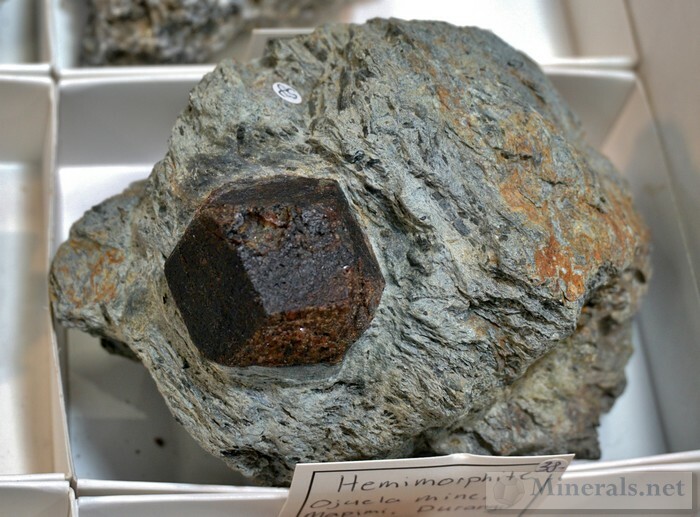 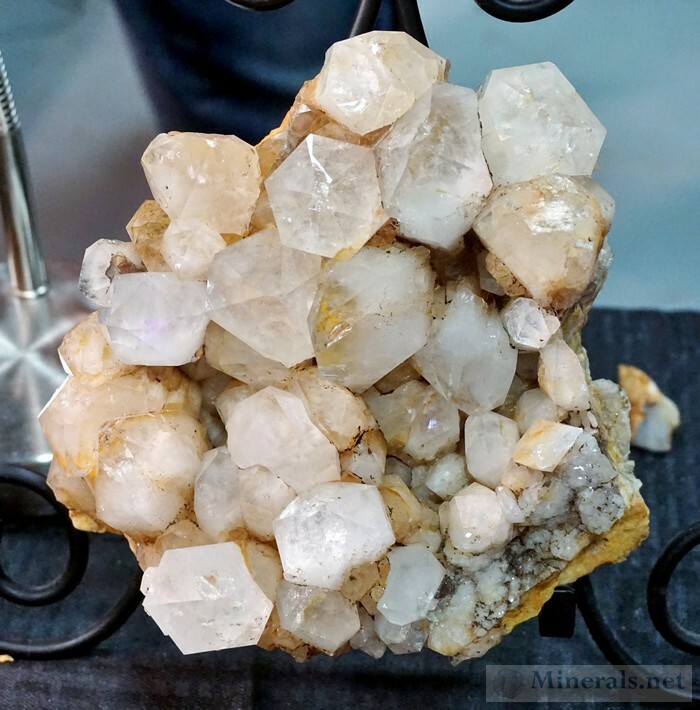 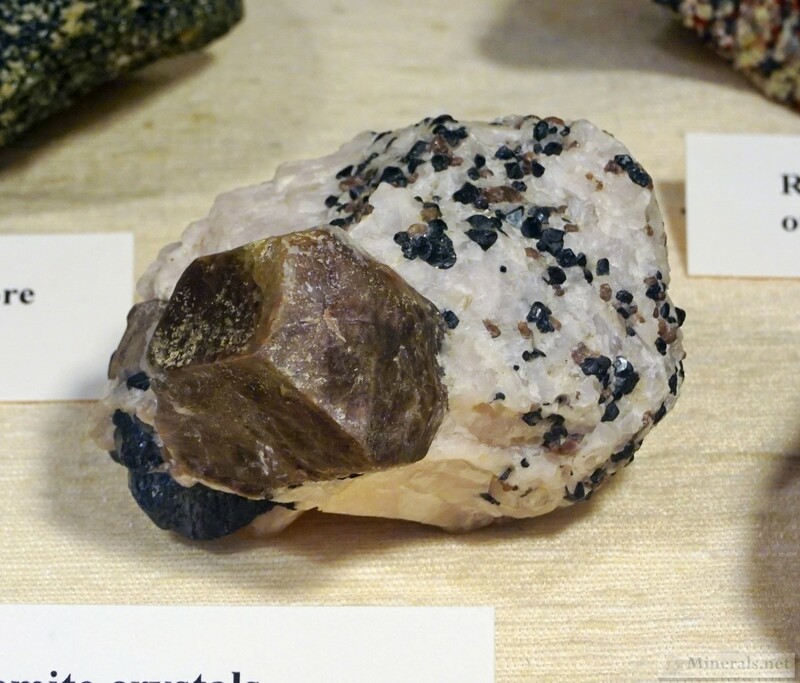 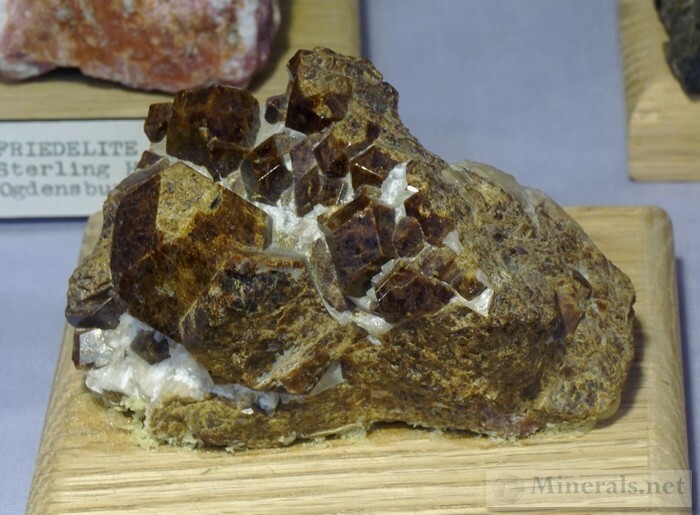 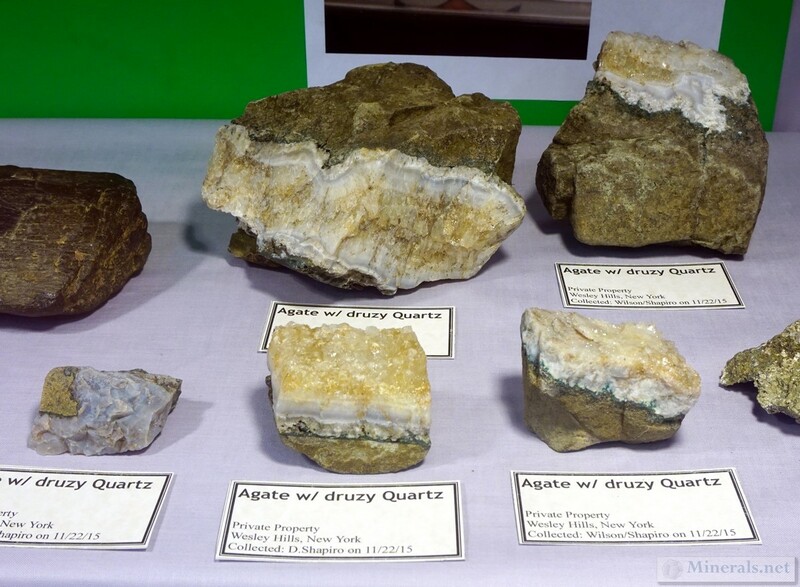 This post shows some of the interesting minerals that were on display on the public exhibits at the The 2016 NY/NJ Show in Edison, New Jersey. 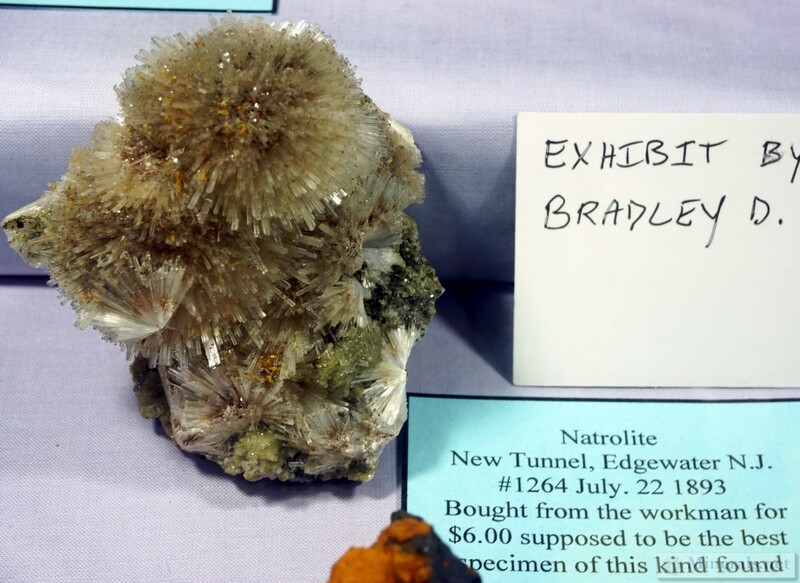 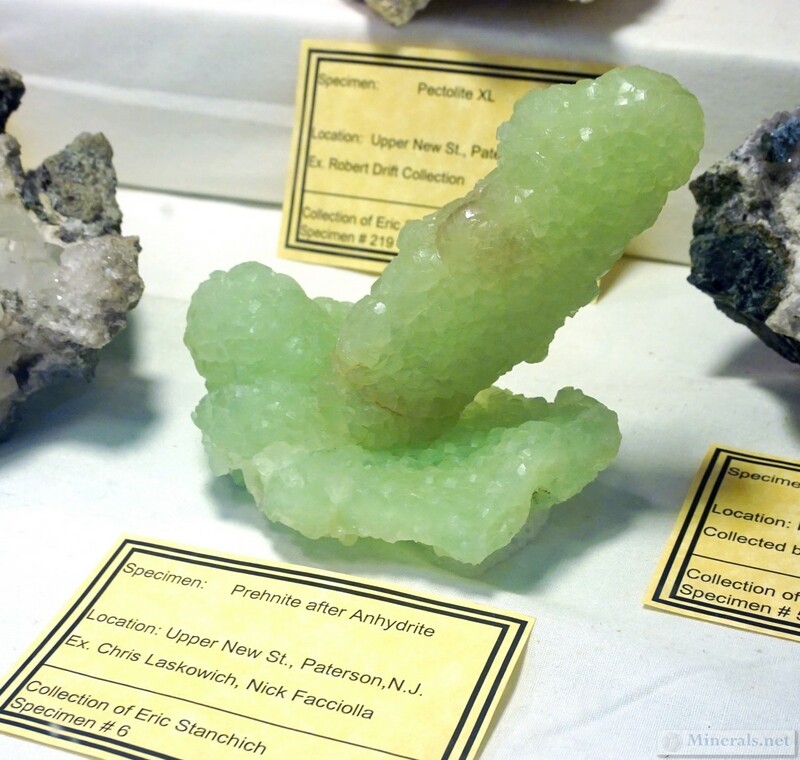 Within the public displays, there was a very nice variety of unique minerals on exhibit, with a special emphasis on Northeast localities, especially New Jersey. 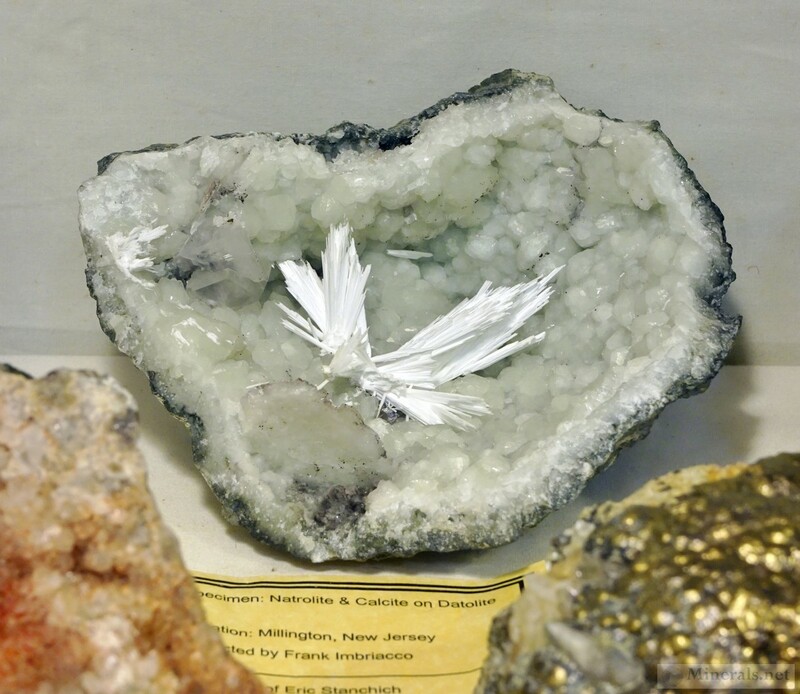 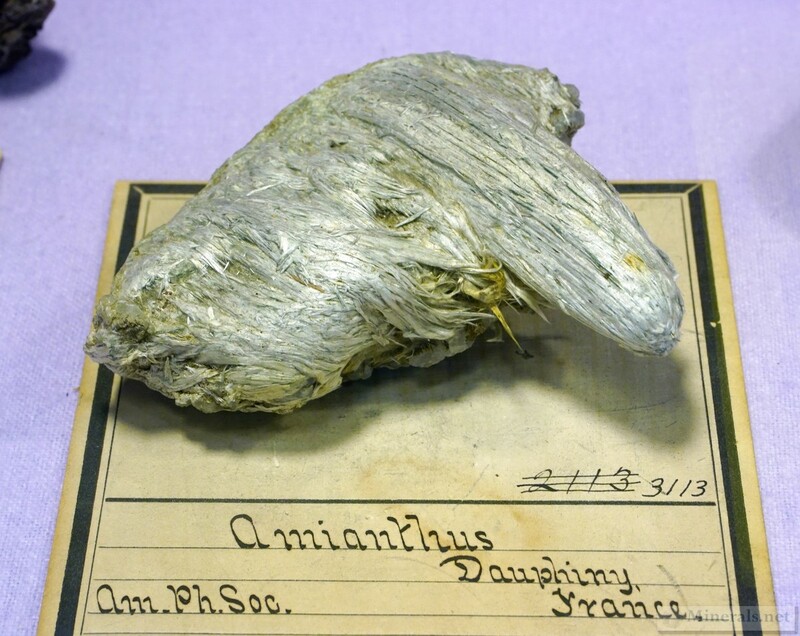 Collected during N.Y. Mineralogical Club Trip March 21, 1988. 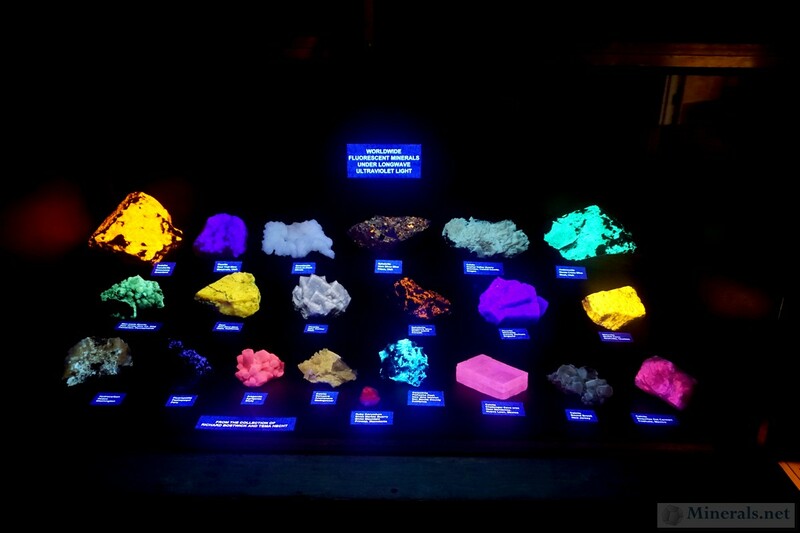 Unlabeled Case. 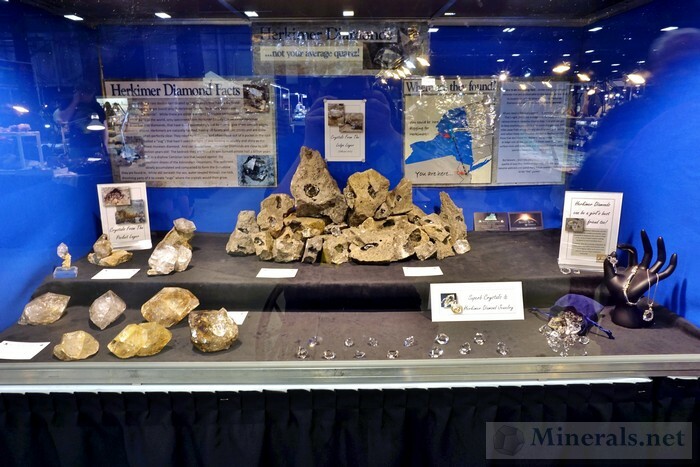 One of the highlights of the NY/NJ Show this year was the display exhibits. 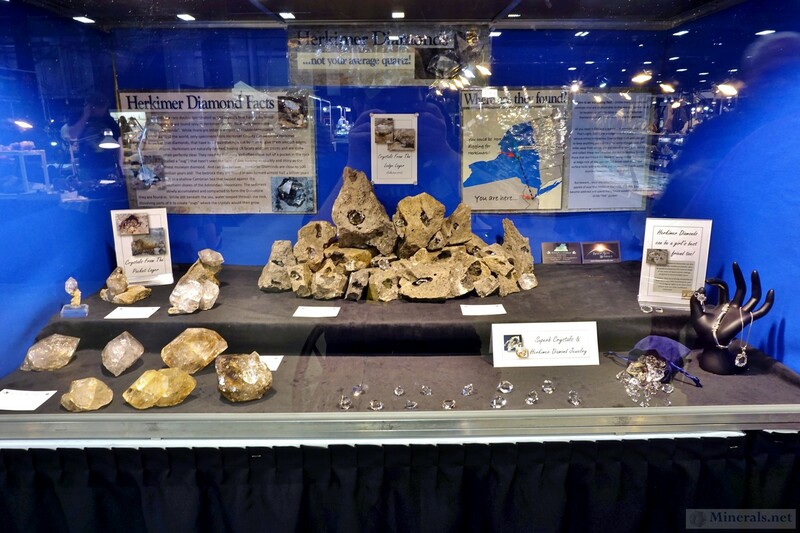 Local collector and dealer Gary Maldovany spent much time and effort recruiting the local collectors to put together fine display exhibits. 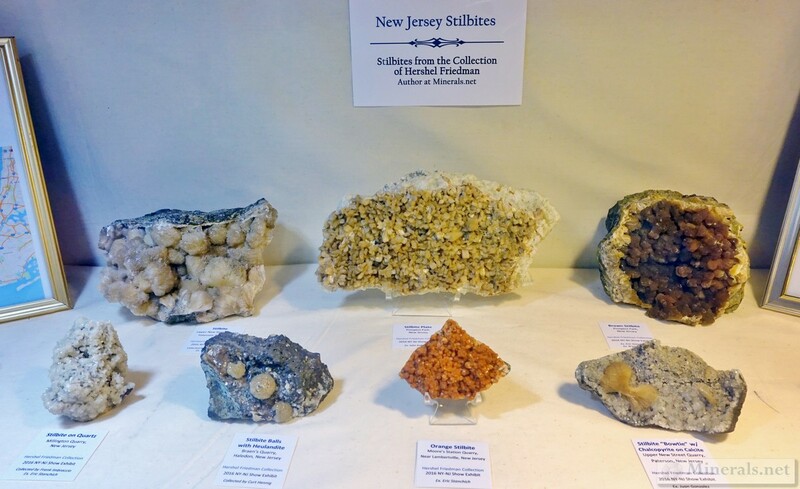 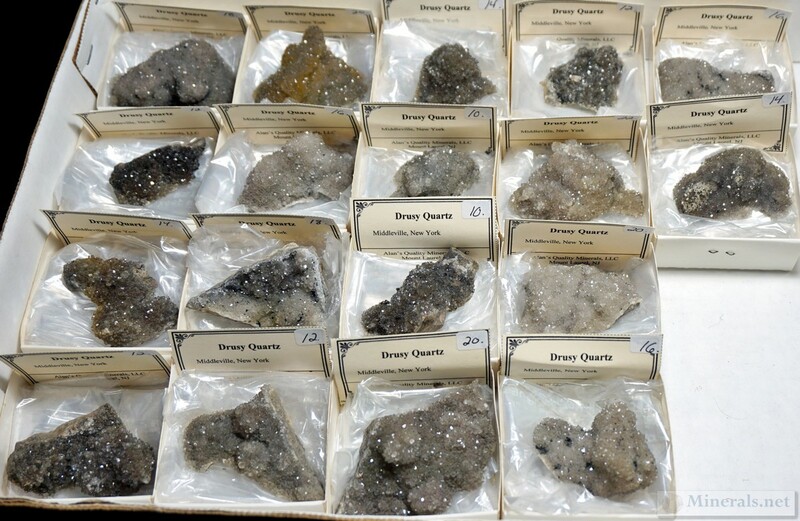 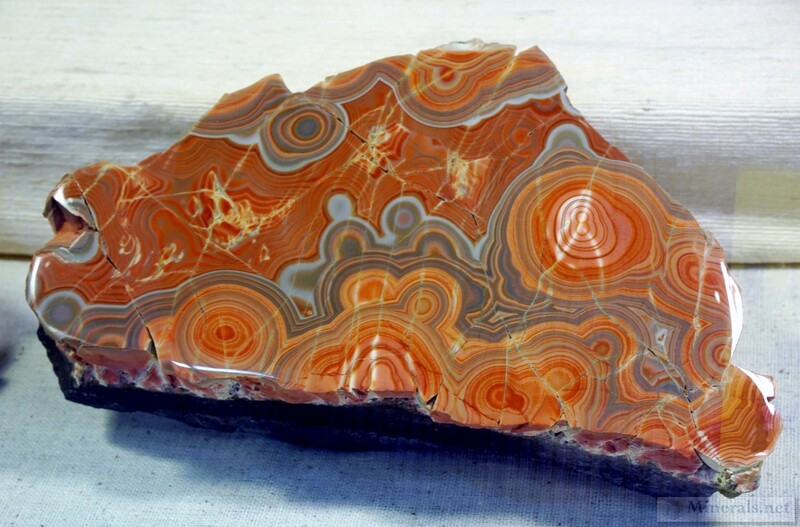 The results were phenomenal, with a very nice selection of minerals, especially local New Jersey Minerals. There were about 20 cases filled by clubs and local collectors.